THE HISTORY OF FUNDAMENTALISM is primarily the story of men debating, men starting organizations, and men founding colleges and seminaries. But that is only part (albeit the largest part) of the story. Women certainly played key roles behind the fundamentalist scenes. Ninety percent of Sunday school teachers were women; women raised millions for foreign missions; thousands served on the mission field; women led the fights for the poor, for women’s suffrage, and for Prohibition. Fundamentalist women also played up-front roles in the rising movement. A few fundamentalist institutions, especially in the late 1800s, supported women’s preaching and ordination. In 1888 Christian & Missionary Alliance’s (C&MA) Nyack College awarded its annual preaching prize to a woman. In those days, Moody Bible Institute (MBI) trained scores of women who became evangelists, preachers, and pastors. Gordon Bible College in Boston assigned female students to summer pastorates in rural New England to prepare them for what historian Janette Hassey calls “the wide ministry of [female] alumnae serving as preachers, pastors, and Bible teachers.” The Salvation Army’s Catherine Booth preached twice at Chicago’s Moody Church. Women were featured speakers at Bible and prophecy conferences, which were incubators for fundamentalism. D. L. Moody’s Northfield Conference in 1880 featured popular women preachers such as Maria Gordon, leader of the Boston area WCTU. Winona Lake Bible Conference (with 10,000 visitors each summer) promoted and welcomed women speakers such as the Salvation Army’s Evangeline Booth-Clibborn and female MBI graduates. One mbi graduate taught New Testament and Christian fundamentals; another spoke on “Christ and Modern Questions.” Dr. Henry Savage, a leading fundamentalist and pastor of First Baptist Church in Pontiac, Michigan, invited evangelist Amy Stockton to speak at his Maranatha Bible Conference. During the height of the fundamentalist—modernist controversy, many fundamentalist churches, including W. B. Riley’s First Baptist Church of Minneapolis, welcomed women to their pulpits to speak to mixed audiences on temperance and women’s voting rights. Evangelist and Bible teacher Uldine Utley preached revival for five weeks from John Roach Straton’s Calvary Baptist pulpit in New York. The revival concluded with 10,000 at Madison Square Garden. Maybe not as pastors, but in many cases, women served as preachers, teachers, and organizers in the fight against modernism. Sundays without rest. Helen “Ma” Sunday (right) was the one who managed her husband, Billy’s, extensive evangelistic campaigns. After his death in 1935, she became a speaker in her own right, as well as a fund raiser for fundamentalist causes. She also served on the board of Bob Jones University. How fundamentalists strove mightily to make sense of history. The leading historian of fundamentalism assesses the damages inflicted by the fundamentalist-modernist controversy. A fundamentalist historian answers the critics of fundamentalism. 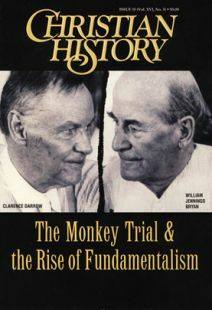 Resources for further study of fundamentalism and the Scopes trial.